Troparion (Tone 8): With profound wisdom and love for mankind, You arrange all things* and bestow beneficial things upon all, O only Creator and Lord. * Grant rest to the souls of your servants,* for they have placed their hope in You,* our God, Who made and shaped us. +Glory be to the Father and to the Son and to the Holy Spirit. Kontakion (Tone 8): To the souls of Your servants, O Christ,* grant rest among the saints* where there is no pain,* no sorrow, no mourning,* but only life without end. 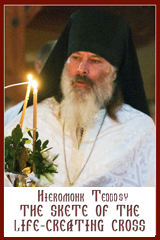 Theotokion (Tone 8): In you we have a rampart and a haven,* and an intercessor most acceptable to God,* whom you bore, O virgin Mother of God,* salvation of the faithful. 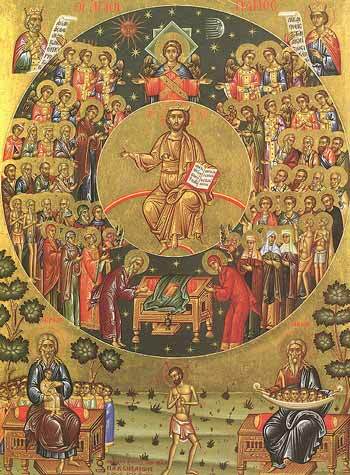 Prokimenon (Tone 6): Their souls shall dwell* amidst good things (Ps 24:13). verse: To You, O Lord, I have lifted up my soul (Ps 24:1). 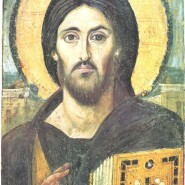 and I would heal them.” Let it be known to you then that this salvation of God has been sent to the Gentiles; they will listen.’ He lived there for two whole years at his own expense and welcomed all who came to him, proclaiming the kingdom of God and teaching about the Lord Jesus Christ with all boldness and without hindrance. Epistle (1 Thes 4:13-17) (Deceased): Brethren, we do not want you to be uninformed, brothers and sisters, about those who have died, so that you may not grieve as others do who have no hope. For since we believe that Jesus died and rose again, even so, through Jesus, God will bring with him those who have died. For this we declare to you by the word of the Lord, that we who are alive, who are left until the coming of the Lord, will by no means precede those who have died. For the Lord himself, with a cry of command, with the archangel’s call and with the sound of God’s trumpet, will descend from heaven, and the dead in Christ will rise first. Then we who are alive, who are left, will be caught up in the clouds together with them to meet the Lord in the air; and so we will be with the Lord for ever. Alleluia (Tone 6): Alleluia, alleluia, alleluia! verse: Blessed are they whom You have chosen and taken to yourself (Ps 64:5). verse: And let their memory be from generation to generation. Gospel (John 21:15-25): At that time, when they had finished breakfast, Jesus said to Simon Peter, ‘Simon son of John, do you love me more than these?’ He said to him, ‘Yes, Lord; you know that I love you.’ Jesus said to him, ‘Feed my lambs.’ A second time he said to him, ‘Simon son of John, do you love me?’ He said to him, ‘Yes, Lord; you know that I love you.’ Jesus said to him, ‘Tend my sheep.’ He said to him the third time, ‘Simon son of John, do you love me?’ Peter felt hurt because he said to him the third time, ‘Do you love me?’ And he said to him, ‘Lord, you know everything; you know that I love you.’ Jesus said to him, ‘Feed my sheep. Very truly, I tell you, when you were younger, you used to fasten your own belt and to go wherever you wished. But when you grow old, you will stretch out your hands, and someone else will fasten a belt around you and take you where you do not wish to go.’ (He said this to indicate the kind of death by which he would glorify God.) After this he said to him, ‘Follow me.’ Peter turned and saw the disciple whom Jesus loved following them; he was the one who had reclined next to Jesus at the supper and had said, ‘Lord, who is it that is going to betray you?’ When Peter saw him, he said to Jesus, ‘Lord, what about him?’ Jesus said to him, ‘If it is my will that he remain until I come, what is that to you? Follow me!’ So the rumour spread in the community that this disciple would not die. Yet Jesus did not say to him that he would not die, but, ‘If it is my will that he remain until I come, what is that to you?’ This is the disciple who is testifying to these things and has written them, and we know that his testimony is true. But there are also many other things that Jesus did; if every one of them were written down, I suppose that the world itself could not contain the books that would be written. Gospel (Jn 5:24-30): The Lord said to the Jews who had come to him: Truly, truly, I say to you, anyone who hears my word and believes him who sent me has eternal life, and does not come under judgement, but has passed from death to life. ‘Very truly, I tell you, the hour is coming, and is now here, when the dead will hear the voice of the Son of God, and those who hear will live. For just as the Father has life in himself, so he has granted the Son also to have life in himself; and he has given him authority to execute judgement, because he is the Son of Man. Do not be astonished at this; for the hour is coming when all who are in their graves will hear his voice and will come out—those who have done good, to the resurrection of life, and those who have done evil, to the resurrection of condemnation. ‘I can do nothing on my own. As I hear, I judge; and my judgement is just, because I seek to do not my own will but the will of him who sent me. Communion Verse: Blessed are they whom You have chosen and taken to yourself, O Lord;* and let their memory be from generation to generation (Ps 64:5). Alleluia! (3x).